STEM Scouts isn’t the only place to enjoy STEM! In fact, many of the activities and awards offered in Cub Scouting, Scouts BSA, and Venturing focus on STEM (Science, Technology, Engineering, Mathematics) topics. There are some special STEM awards you can earn in Cub Scouting, Scouts BSA, and Venturing called Nova Awards. These have two levels: the Nova and the Supernova. The Nova level award is meant to be an age-appropriate introduction in detail to STEM topics; you can earn these by working with your parent’s or leader’s supervision. The Supernova level award requires that you work with a registered Supernova Mentor who has specialized, professional knowledge in certain STEM areas. Of course, you don’t have to pursue a Nova Award to explore STEM-related topics. Many of the Adventure Loops you’ll earn in Cub Scouts (elementary school) include basic STEM concepts. The Scouts BSA (middle and high school) merit badge program offers dozens of topics ranging from Astronomy to Environmental Science to Space Exploration and more. 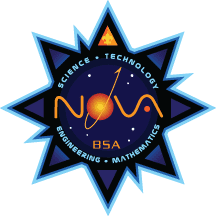 Our STEM in Scouting Committee maintains a separate website with additional information about Nova Awards and STEM-specific activities; visit it at www.bsastemnova.org. Our premiere STEAM (the “A” stands for Art) camp provides engaging, exciting, and hands-on activities in Austin Independent School District’s state-of-the-art Applied Technology Center at Anderson High School. Camp attendees will use tools like DSLR cameras, laser cutter/engravers, 3D printers, robotics kits, hydrology display boards, Adobe Creative Suite and Labview software to explore, design and create. TechLab has its own website with more information; visit it at www.techlab.camp. This is a one day event with several short learning opportunities where Cub Scouts or Scouts BSA Scouts can earn one or more Nova Awards that same day! There’s also a midway of activities and displays just for fun and for all ages. You can learn more information by visiting our STEMboree page, located at this link. This weekend STEM event is designed to get Scouts BSA youth started on earning the prestigious NOVA Award and start learning STEM skills, such as Robotics, Welding, Engineering, Automotive Maintenance, and more. The Hornaday Award Weekend provides Scouts BSA youth a path toward earning Scouting’s highest conservation award, offering all 21 Hornaday-qualifying merit badges, Leave No Trace classes, and conservation project opportunities. The Hornaday Award Weekend program has its own website with more information; visit it at www.hornadaybsa.org. The Microsoft Store at The Domain shopping center in North Austin offers periodic one-day classes for Scouts to earn the Moviemaking, Game Design, or Robotics Merit Badges. To learn more, visit this page.